so I decided to start on this one thinking that it would be a lot easier and be a pretty "short term win". Boy was I wrong. I had wanted to incorporate some sort of tapestry into the apartment since we moved in, but I wasn't sure where to put it exactly. For quite some time I had imagined that there would be a headboard behind the bed, and perhaps some pictures on the wall. I think it took the frustration of the setbacks happening in the living room for me to come up with this totally different idea in this room. 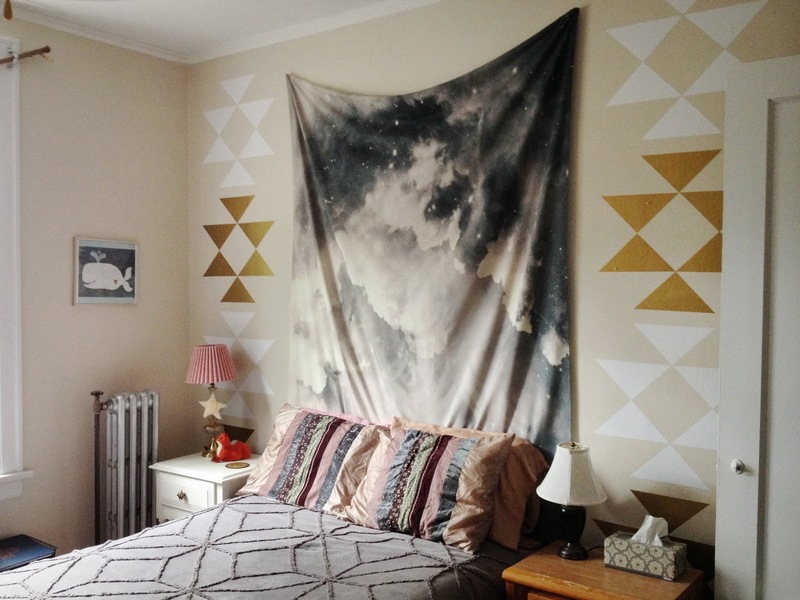 It was a little bit of my love of the current geometric metallic trend, paired with the southwestern print thing (which I did see on pinterest, so this isn't my original idea or anything), and the incorporation of the tapestry that made this whole thing really come together. 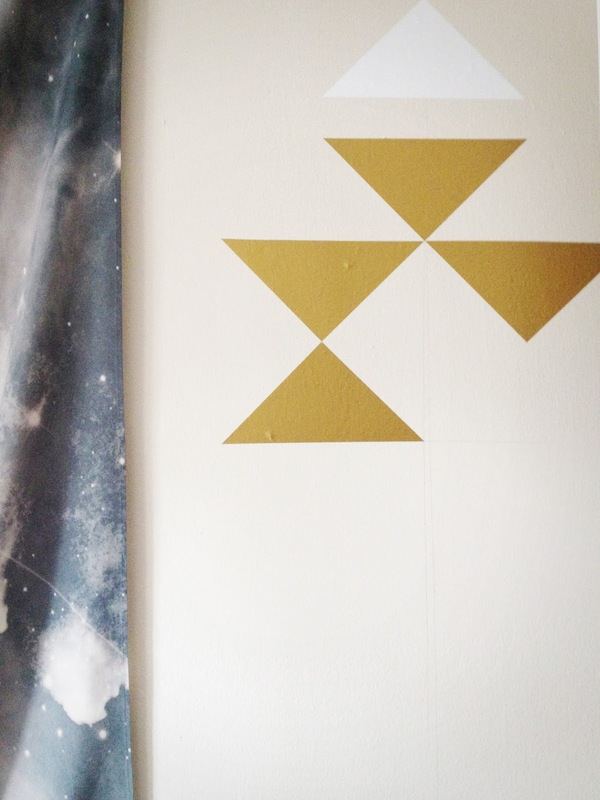 I always have the urge to paint when I move somewhere, but its probably not advised when renting (I've been there, repainting the room before moving out and scraping off hundreds of metallic owls). 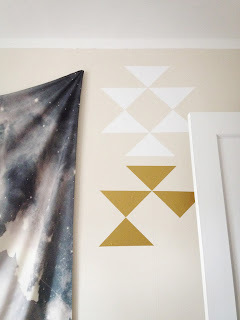 So at some point it dawned on me (and I really don't know why it didn't happen sooner) that I could probably find metallic vinyl wall clings online, and that a tapestry hanging over the bed sounds way cooler and hip than a tufted headboard (though I still love them!). 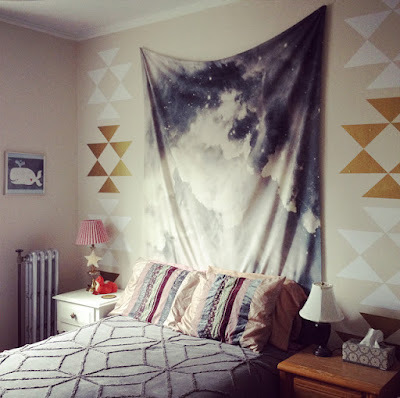 So I got online and I ordered the bedspread (simple with the one tone, but still interesting with the textured print) and the tapestry from Urban Outfitters, and after spending a lot of time debating between two tapestries and consulting the boyfriend on the pros/cons of each, we decided on the starry cloud one. The vinyl triangles I bought from SurfaceInspired on Etsy, and they arrived in a reasonable amount of time. We received the bedspread soon as well, but when I checked on the tapestry it was still on backorder even though it had originally looked like it would ship a few days later than the other items. When I checked back online it was suddenly 2 more weeks delayed. The pushback on the date seemed a little strange, so I called the shipping dept. and found out that the true date was July 30th. Mind you, this was the middle of May. So this project that was originally supposed to be my "short term win" was suddenly set back three months!!! Once we received the vinyl clings I didn't want to put them up without the tapestry for spacing reasons. The whole thing was completed somewhat recently but I'm very happy about the result, despite the wait. I may want to change those pillowcases still (possibly like a light blue color to match the whale picture), but I think we're looking pretty good for now.